Easter is filled with tradition and the dinner table is no exception. 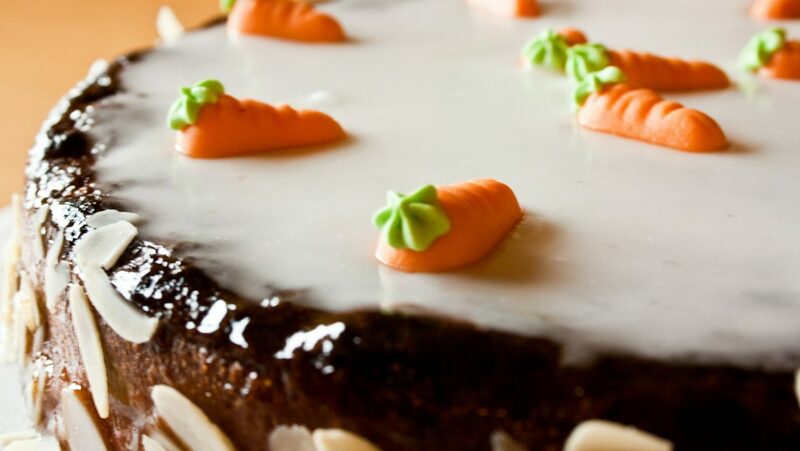 From hot cross buns to the choice between lamb or ham, even new York style cheesecake, there are many great dishes that your family will enjoy this Easter. Combine warm water, butter, milk, 1/4 cup sugar, salt, egg, egg white, flour, and yeast. Knead mixture for 5 minutes. Add currants and cinnamon. Put dough in a warm place until it doubles in size. Punch down on floured surface, cover, and let rest 10 minutes. Bake at 375ª F for 20 minutes. Remove from pan immediately and cool on wire rack. To make crosses mix together confectioners’ sugar, vanilla, and milk. 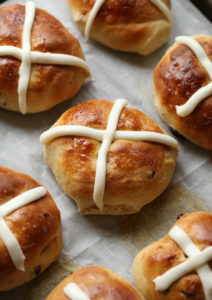 Place glaze in a piping bag and pipe a cross onto each roll. Preheat oven to 325º F. Place the ham on its side in roasting pan. Mix honey, brown sugar and spices in small bowl until well blended. If mixture is too thick, microwave on high 30 seconds to 1 minute or until smooth, stirring after 30 seconds. Brush 1/2 of the honey mixture over ham, gently separating the slices so mixture can reach middle of ham. Cover loosely with foil. Bake 1 hour, basting occasionally with pan drippings. Remove foil. Brush with remaining honey mixture. Bake 45 minutes longer. 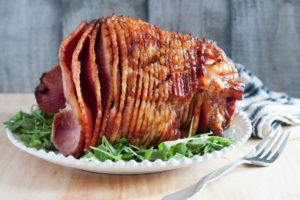 Serve ham with pan drippings. While the eggs are boiling prepare an ice water bath and set aside. After 14 minutes, remove the eggs from the water and place in the ice water bath. Once the eggs have cooled completely, peel them and slice in half lengthwise. Remove the yolk to a small bowl with a spoon and place the egg whites on a plate. Mash the yolks with a fork and add the mayonnaise, mustard, vinegar, sugar, salt and pepper. Stir everything together. 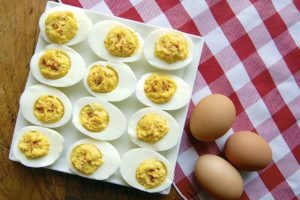 Use a spoon to add a portion of the deviled egg mixture back into the hole of each egg white. Sprinkle on paprika for garnish. Preheat oven to 350º F. Grease a 9″x13″ baking dish. Place 1/3 of the potatoes in the bottom and season with salt and pepper. Pour 1/3 of the cream sauce sauce over top. Repeat layers ending with cream sauce. Cover and bake for 45 minutes. 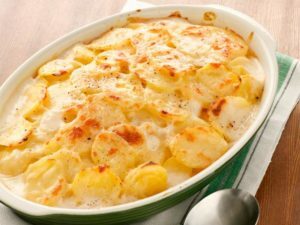 Uncover and bake for an additional 35-45 minutes or until golden brown and potatoes are tender. Broil for 3-4 minutes to obtain a golden top. Once all of the liquid has been added, bring to a boil over medium heat while continuing to whisk. Stir in salt and pepper and let boil 1 minute. Preheat oven to 350º F. Lightly grease the bottom and sides of a 9-inch springform pan. Mix graham cracker crumbs and melted butter in a bowl until evenly moistened. Press crumb mixture into the bottom and about 1/2-inch up the sides of the springform pan. Whisk flour, sour cream, and vanilla extract in bowl. Set aside. Stir cream cheese and sugar with a wooden spoon in a large bowl until evenly incorporated, 3 to 5 minutes. Pour milk into cream cheese mixture and whisk until just combined. Whisk in eggs, one at a time, stirring well after each addition. Stir in lemon zest, orange zest, and sour cream mixture; whisk until just incorporated. Pour mixture into prepared springform pan. 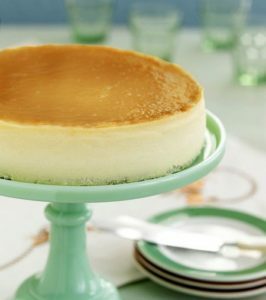 Bake in the preheated oven until the edges have nicely puffed and the surface of the cheesecake is firm except for a small spot in the center that will jiggle when the pan is gently shaken, about 1 hour. When the cheesecake is done, turn off the oven and let it cool in the oven for 3 to 4 hours. This prevents any cracks from forming on the top of the cheesecake.